Soccer cleats do not come in widths, which can make it difficult to obtain a good fit. Since many medium width cleats will run either wide or narrow, you can use a side-by-side comparison to identify volume differences between different pairs of shoes. 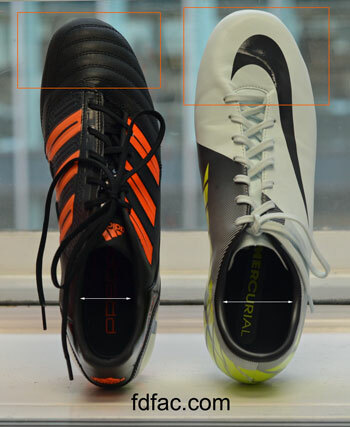 The two pairs of cleats below illustrate a narrow lasted cleat on the left, Adidas Predator Absolion TRX , and a wide lasted cleat, Nike Mecurial Victory II, on the right. The differences in width are highlighted. Comparing the uppers, notice how the throatline (opening) of the Nike is so much wider than the Adidas. Also notice the difference in toebox shape and width. The Adidas is more tapered around the toes and the Nike is more rounded, accommodating a wider forefoot. 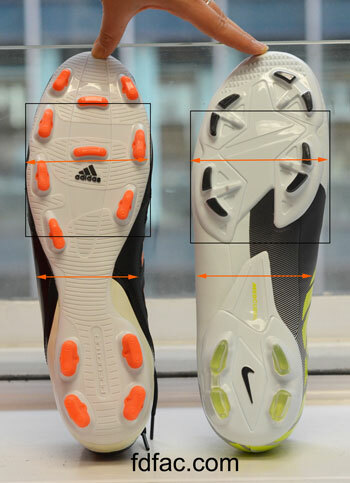 In evaluating the lower, you can see how much wider the forefoot and waist are in the Nike than the Adidas as well. If you have been having difficulty finding the perfect fit, using this method should help. These principles also apply to other shoes (tennis, basketball, football, etc.) that only come in medium widths. This entry was posted in Shoe Fit, Sport Specific Shoes. Bookmark the permalink. who love the sports they play. Sizing cleats is so important. I make sure my daughters cleats always fit right before playing sports. When I was younger I had the hand me downs that were too big and I use to get black in-grown toenails. Always hurt so bad and made me retire sports season early. The modern “slipper” leather can stretch, so the width of the upper may be accommodating, except for the fact that there may develop a gap between the upper and the insole…. sufficient, for example, to produce a blood blister for a Man Utd Welsh International whose contract switched him from Adidas to Puma – painfully as it turned out. It is also fortunate that there is no longer a receptacle on the insole for the screw in cleat/stud.